Constructive dismissal has raised its head of late, piquing everyone's curiosity as to what it is. Here we lay out the fundamentals of constructive dismissal claims and how you can protect your company. With employment tribunal fees still banned, employers need to be aware of the potential claims that could be lodged against them. Amongst those bosses need to know is constructive dismissal, because it has nothing to do with perceptions or misunderstandings. It means you breached an employment contract. A contract of employment is an agreement between an employer and employee, setting up the foundations for a mutual relationship of sorts. It regulates the behaviour of staff, sets out a disciplinary code, but also places expectations and obligations on the employer. It’s legally binding. So making changes without the consent of the employee, for example, is a risky move. As is ignoring the expressed and implied terms agreed to in the contract. When you breach that contract, you’ll find yourself face-to-face with constructive dismissal. It’s when you’ve breached the contract in such a serious way that the employee resigns. The sentiment, however, is that your breach made the contract null and void, so they have grounds to treat themselves as having been dismissed. And if they’re successful in their claims, they won’t be held to the post-termination restrictions on a contract. What are the grounds for constructive dismissal? Contrary to belief, constructive dismissal has nothing to do with an employer behaving unreasonably. There needs to be a breach of expressed contractual terms or the implied terms of trust and confidence – and they need to be able to prove it was a fundamental breach rather than a minor one. More often than not, it involves a continuing pattern of behaviour or incidents. According to employment law business Landau Law, there is something called “the last straw”. Not all contracts are the same though, so the severity of your conduct or breach comes down to each individual circumstance. This makes it tricky to mitigate against a constructive dismissal claim. But there are a few universal no-nos that hold strong on any contract. • Humiliating staff in public. Of course, if an employee hasn’t made the effort to resolve the matter, then it becomes far more difficult for them to make a constructive dismissal claim. 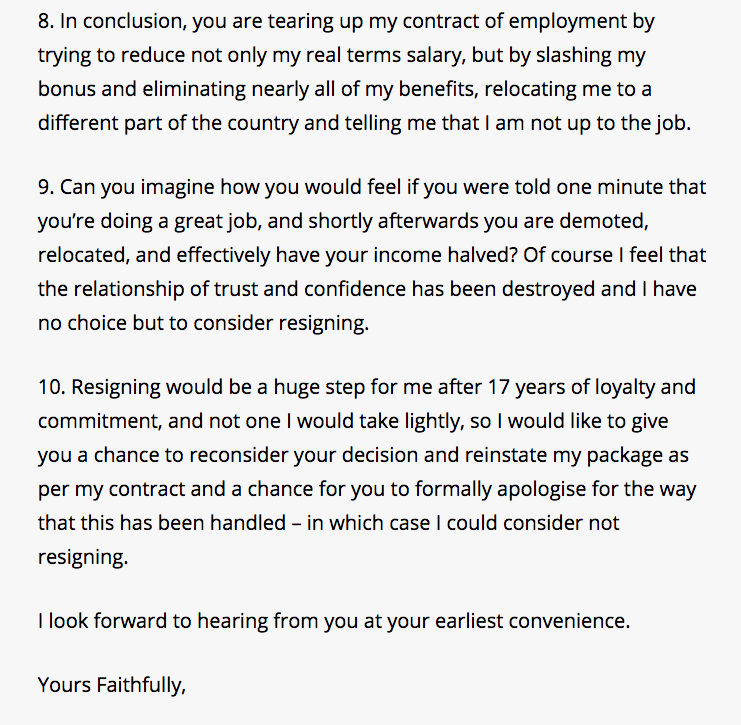 What does a typical constructive dismissal resignation letter look like? It will be made clear from the get-go that you have a constructive dismissal resignation on your hands. They normally come as grievance letters first, and its contents and tone will indicate what’s coming. For a better idea of what to look out for, we hunted down templates written by law experts and stumbled across this one prepped by Monaco Solicitors. In this particular scenario, the employee is bringing up a formal grievance, letting you know they have grounds for constructive dismissal. They expect things to be rectified. The letter goes down a full ten bullet points. It’s the last straw kicking in, and employees will need to show they have a leg stand on. But it’s the end of this particular grievance note that suggests a claim could be in order. Leaving a resignation for too long, however, could be seen as an act of waiving the breach according to Landau Law. 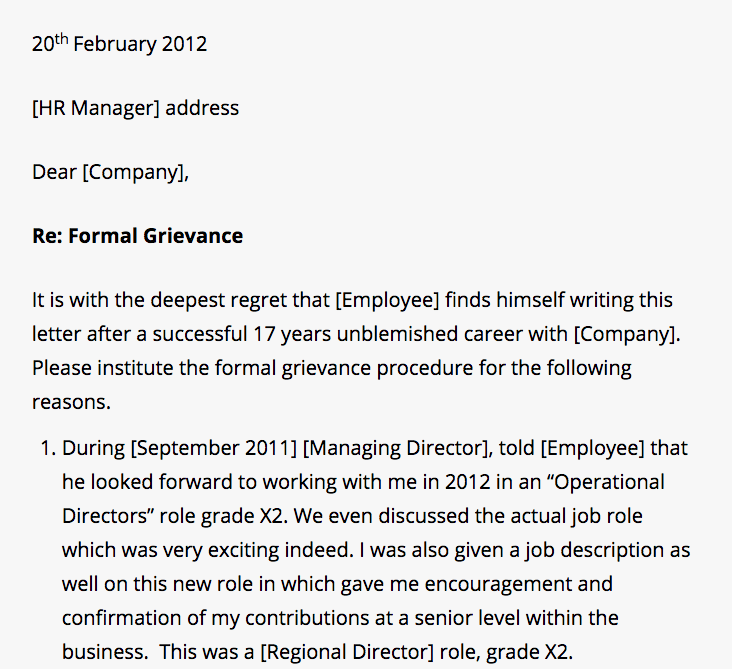 “This can happen where there is a long delay in lodging a grievance or resigning. Essentially, if employees stay too long after a breach, it’s considered acceptable and they will no longer have grounds for constructive dismissal. What is the constructive dismissal qualifying period? As is the case with unfair dismissal, someone has to be working under your employ continuously for two years before they can raise a constructive dismissal claim. Without those two years, an employer could easily dismiss such claims – even if they genuinely did wrong. They would unlikely face legal repercussions, though there would be a hit to reputation, which could be equally as damaging to a business. If you victimise an employee for revealing malpractice, if discrimination is involved or there has been a direct and blatantly obvious breach of contract, the qualifying period is thrown out the door. As such claims require evidence, it can be tricky for an employee to prove. Monaco Solicitors goes so far as to say only 5% of claims succeed. But better safe than sorry. For starters, it doesn’t mean you’re never allowed to change your T&Cs. Doing so is perfectly acceptable under employment law. What matters is that you do it properly. Specialist law company Ellis Whittam suggests keeping these four points in mind if you want to reduce the risk of constructive dismissal. “Make sure you are familiar with the terms in your contracts and do not take any steps that violate them. “If you want to make changes to a term in the contract, you will need to consult with the employee first. If you fail to do this, it may be considered a breach of contract. “Managers should be trained to spot workplace problems and step in to prevent them from escalating. Employees in the habit of treating their staff well and listening to grievances will find it easier to resist claims.